The proverb, "An apple a day keeps the doctor away" hasn't lost its gravitas. Apples are extremely rich in antioxidants and are high in vitamin C and Vitamin B Complex. They give our red blood cells and nervous system the right kind of nutrition. Also the high amount of dietary fibre keeps cholesterol levels in check. Apples mixed with Bananas, give the much-needed energy and stamina boost. The combination helps in strengthening bones and improving digestion. 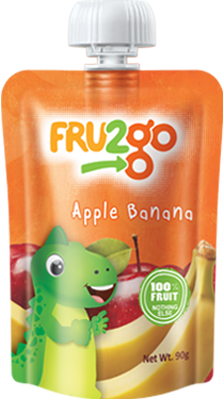 Since there is no added sugar or preservatives in FRU2go, a 90g pouch provides a uniquely satisfying texture and taste for your palette which is also a great source of energy. If you mix these with the goodness of bananas, you also get the benefits of potassium, serotonin and dietary fibre, which help manage weight, give energy and are said to improve mental health. Banana's qualities mixed with the nutrients of strawberries make FRU2go a complete healthy snack for - whenever hunger strikes. If the right mango makes you nostalgic of childhood summer vacations, imagine what it would be like to have the same pure mango pulp on the go, without worrying about cutting, peeling and rotting. 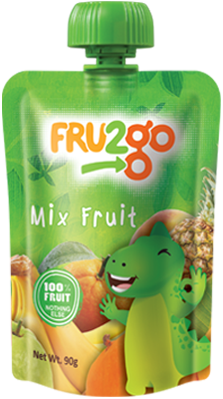 FRU2go brings mango fruit blend which will fight heat strokes, boost your immunity and improve digestion. Enjoy.